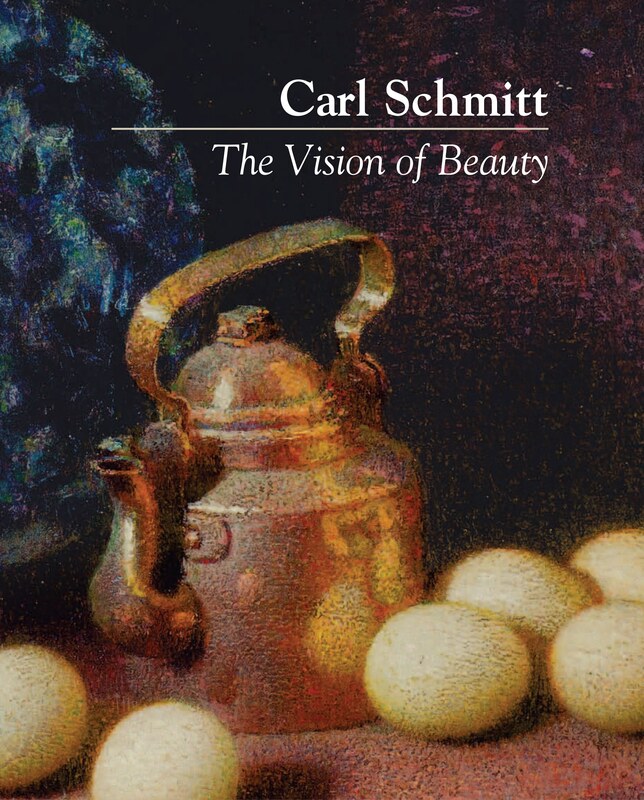 Welcome to The Vision of Beauty, a blog dedicated to the art, life, and thought of the American artist Carl Schmitt. By any measure, Carl Schmitt’s life, work, and thought were remarkable. Many have been impressed by his paintings or his profound reflections on art, others by his life as a devout husband and father of a large family under extraordinary circumstances. Beyond this, however, Schmitt stands out because of his complete dedication to portraying the beauty of created reality through his art, and inviting others to contemplate it with him. Eggs and Copper, oil on hardboard, 12 x 15 in. Private collection. My own sense of my grandfather’s greatness has been confirmed by the dozens of emails and inquiries I’ve received from all over the country and by the conversations I’ve had with many people about my grandfather at exhibits, talks, and other presentations sponsored by the Foundation. I have yet to come across a person who has not found Carl Schmitt’s art, life and thought exciting, revelatory, stunning. If my grandfather had a “secret,” it was that he saw life as a gift—a gift received from God to be given back to him through other people. Within this dynamic, art played a vital role in his life, both as a gift received and returned. Schmitt’s gift to us is the tremendous legacy we see in his art, his thought, and finally in the generous life he led, a life in which he strived to give fully what he himself had been given. Self-Portrait, c. 1965, oil on canvas, 30 x 25 in. Each week, Wisdom on Wednesdays offers a brief reflection by Carl Schmitt on art, life, the person, society, and many other topics. Mysticism on Mondays delves deeper into Schmitt’s reflections on the relationship between art, life, and religion. We also feature periodic updates on new and noteworthy developments at the Carl Schmitt Foundation. Schmitt considered this painting, a portrait of the the artist’s son, as one of his finest works. If this is your first visit to the blog, let me suggest a few posts to get you acquainted with Carl Schmitt’s life and vision, as well the work of the Carl Schmitt Foundation. —and there’s much more at our website, including a gallery of Schmitt’s works, a selection of his writings, archives of the CSF News, and ways you can support our mission to enrich people’s lives through the spread of Schmitt’s wonderful legacy. Thank you for your interest in Carl Schmitt and I hope you enjoy the blog. Love the Website. Can you give me any information on Carl’s Father in law? Austin Willard Lord. Thank you so much and keep up the great work. Thanks for your comment. Most of the historical facts on Lord can be found in his article at Wikipedia (written by yours truly). Here are some additional items you may find interesting. Lord was a direct descendant of one of the founders of Hartford, Connecticut, Thomas Lord (1585-1678), who had come to America in 1635. Some time in the nineteenth century his forebears migrated to the Midwest for reasons unknown but probably in search of better farmland. His father, Orville Lord, was one of the first settlers in the area of Winona, Minnesota, now a modest city 100 miles southeast of Minneapolis. Lord had a successful career as an architect and was much esteemed by his colleagues, but had his share of disappointments as well. A number of major commissions which he and his partner James Hewlett competed for fell through, and it seems he was more than happy to lay aside most of his practice by 1915 or so, when he was only 55 years of age. He had been devoting more and more time to his painting in Silvermine, and had first exhibited with the Silvermine Group of Artists (later reorganized as the Silvermine Guild of Artists) in 1909. He would be active in the group for the next decade. Lord first met Carl Schmitt around 1910 and the two became close friends, despite their difference in age (Lord was almost thirty years older than the twenty-one-year-old Schmitt). In a letter to Schmitt in 1916 Lord suggests they share a studio. Shortly after Schmitt married Lord’s daughter Gertrude in 1918, the newlyweds lived with the Lords in Silvermine until Schmitt could complete his own house there in 1919. Unfortunately I have been unable to find any of his architectural drawings or other papers either at MIT (his alma mater) or at Columbia University, where he served a dean of the school of architecture. The Carl Schmitt Foundation has some of his correspondence with his family, as well as few of his watercolors, most done in Europe traveling on a Roth scholarship in the 1880s. I have some additional sources and pictures should you be interested. Thank you so much for the fast reply. I am very interested in all the information and pictures you have access to. I was born and raised in Winona, MN and have graduated from the same college as AWL. (though it was called the Normal School back then) Here at the Historical Society we have the front and back architectural drawings for a mansion AWL designed. I suspect he drew them. I have not been able to study them though. Can you please send me the additional sources you have? I may be able to contribute something as well for your website.